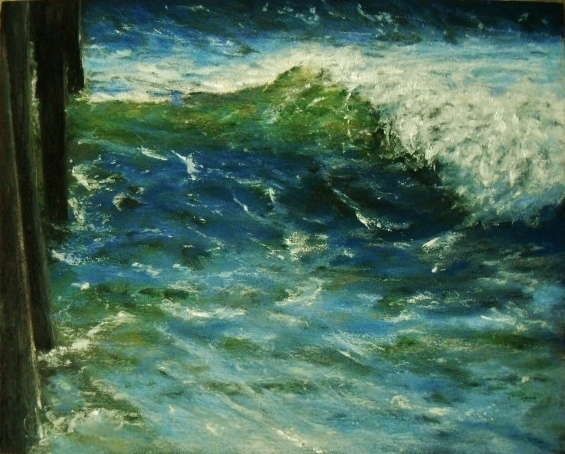 I’ve been itching to get back into seascapes and what better way than a close-up of a crashing wave against the pier. It’s an 8×10 oil pastel . . . enjoy! This entry was posted in About Oil Pastels, OPs New Paintings and tagged beach, Oil Pastel, summer, wave. Bookmark the permalink. I love it. Makes me want to there. Tim, I can’t tell you how much I appreciated reading your comment – when a piece evokes that kind of response it makes the piece all the more worth it. Thank you very much! A very beautiful painting. Love the abstract quality. Thank you for commenting, I really appreciate your thoughts on this painting. I’m not at all surprised that you saw a bit of abstract quality about this piece. Thank you very much! You know how to make my day start out in a beautiful way – thank you so much for your beautiful comments on my painting. Can you sent a little sunshine to here ? HI Petronette -so sorry to hear about your drab weather – I’ll trade you some of our 100+ degrees for a little autumn. Thanks for your wonderful comment. Stay warm! love the movement, the wind, the colors, so beautiful !!! What a magnificent Sea painting Mary ! Just look at the wave curl …. on the brink … and over it goes .. with spume blowing .. oh yes . Ah Poppy, don’t you love a crashing waves? For me, I can’t resist putting it to canvas. So appreciate your descriptive words – very happy that you can see the power of the water. For me, I’m inspired to capture its spirit! Amazing water Mary! It’s translucent, moving and crashing. Quite excellent! Hi Elena, you know how to make my morning! I love to paint water, something so free and loose about the experience of it – I’m thrilled that you see the elements I was working to convey. Feels like I’m actually THERE! Kudos! Thanks Dorann and that’s exactly the feeling I’m trying to convey – putting you into the moment and become a part of the scene. Cool, thanks! Wow! Wow! Wow! I LOVE this! Really! I just feel like I am there! Oh Cyndi you are so encouraging! Don’t you just love a good incoming wave? I’m glad you are in the moment on this painting! One of our favorites! I have family there. I know isn’t it a great place? Thanks so much for commenting. Thank you Eva, always appreciate your feedback – I’m so happy you like it! I can hear those wave crashing… it’s just a fantastic painting. Very real. Just love it! Thank you, I love to hear when someone can feel the scene – your comments are really appreciated. Thanks so much! Mary, this is a wonderful piece. You capture the sunlight in the water so beautifully. One thing I need to do, is venture out with my paintings, like you do. Love it! Hi Patricia, thank you for your comments, especially about the sunlight – I’m always drawn to the sea because there is so much there to work with. Ah Scott, always one for a wonderful story behind your words – thank you! The power and energy of the ocean is a pull, this summer I will not be at a loss for scenes to explore with my oil pastels. being an artist sounds much better than close your eyes and travel somewhere………… I love.. Thank you very much Silvana for your lovely comment! What a wonderful painting Mary! Thank you Tim, much appreciated! Thank you! I have so many seascapes to get started on . . . painting water is a refreshing exercise for me. Happy summer to you and your family! it’s beautiful! isn’t it great when we’ve ‘been away’ from a part of art that we love? we roll up our sleeves like a crash dieter sitting down to a big pizza! Ahhhhh! we are reunited with what makes our hearts sing! 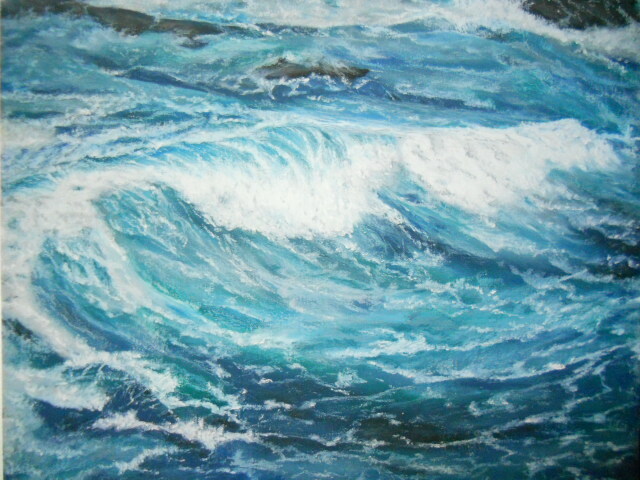 I love painting the sea – it’s a very refreshing time for me. You are so right in your comments – yup like a wonderful pepperoni filled pizza! Thank you for your wonderful comment!